Like his predecessor Roy Bullock, Keith Bradshaw had a long and distinguished career in the Department of the Senate, assumed the office of Clerk at a relatively advanced age, and retired after approximately two years in office. Keith Oscar Bradshaw was born on 28 April 1923 in Broken Hill, New South Wales. He was the second child of Oscar Spelman Bradshaw, a railway car examiner and grocer, and Margaret, née Warburton. The family moved to Sydney in 1930. Keith was a student at Randwick Intermediate High School from 1934 to 1938, and attended Sydney Boys High School from 1939 to 1940. After leaving school he worked as a production clerk at Wallis Knitting Mills, Sydney. In 1942 Bradshaw enlisted in the Royal Australian Air Force, serving in the United Kingdom as a wireless operator and air gunner, before his demobilisation in early 1946. Under a war service scheme he undertook a year of university qualifying training at Sydney Technical College. He studied arts subjects at the University of Sydney during 1947, but soon moved into employment. In 1948 Bradshaw entered the public service as a clerk in the Department of External Territories. In 1950, following short periods in the Department of the House of Representatives and the Department of Commerce and Agriculture, he was appointed to the Department of the Senate as Clerk of the Papers and Accountant, the starting point for parliamentary clerical staff in those days. He soon took advantage of the greater variety of positions in the department, particularly in the expanding committee system. He served as private secretary to the President of the Senate in 1953 and 1954, under a scheme whereby Senate departmental officers were attached to the personal staff of Presidents. For over a year he served as Ministerial Liaison Officer, a position occupied by a Senate Department officer which provided procedural advice to the Leader of the Government and the ministry in the Senate, as well as assistance in programming government business in the chamber. Between 1956 and 1964 he was Usher of the Black Rod, organising openings of Parliament and other ceremonies while performing the committee tasks associated with that position. From 1956 to 1959 he was the secretary to the Joint Committee on Constitutional Review. The appointment of this committee reflected a common belief that revisions of the Australian Constitution were required, particularly in relation to the powers of the two houses. The report of the committee was not unanimous, and nothing came of it, but it exercised Bradshaw’s extensive knowledge of the Constitution, especially in its parliamentary aspects. From 1959 until 1965 Bradshaw acted as secretary to the Joint Committee on Foreign Affairs, which was established by the Menzies Government to provide parliamentary input and consultation on foreign relations, particularly in the context of Australia maintaining its own foreign policy independent of that of the United Kingdom. He was secretary to the Senate Select Committee on the Encouragement of Australian Productions for Television from 1962 to 1963, part of the extension of the Senate’s committee activities. The appointment of the committee reflected a concern about the relatively new medium of television being dominated by foreign productions, and attracted a great deal of interest. As a result of this and other Senate select committees in the 1960s, dealing with a large number of public submissions and conducting public hearings around the country became the norm for Senate committee inquiries. Bradshaw’s most significant committee assignment was from 1967 to 1971 as secretary to the Senate Select Committee on Off-shore Petroleum Resources, which grappled with the difficult legal and technical issues involved in the regulation of offshore oil exploration and recovery. The committee presented two complex reports on the subject. Each of the major committees he served paid tribute to Bradshaw’s valuable work, referring to his ability and untiring devotion to his ‘voluminous duties’, and to his ‘outstanding assistance’. Following a parliamentary delegation to Papua New Guinea in 1964, he stayed on for a time as adviser to the newly established local Legislative Assembly. 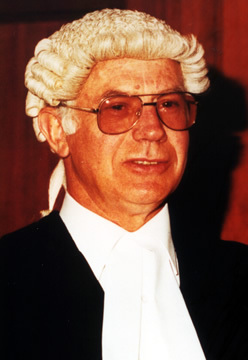 After serving as Clerk Assistant from 1965 to 1973 and First Clerk Assistant from 1973, Bradshaw was promoted to Deputy Clerk on 11 September 1979 and Clerk on 29 October 1980. His assumption of the office of Clerk occurred before the departure of his predecessor, who was placed on the unattached list (not formally retired, but not occupying the position) before his retirement in 1981. Bradshaw took retirement, under new legislation allowing public servants to retire at any time after the age of fifty-five, on 15 July 1982. On 4 October 1948, at St John’s Church of England, Canberra, he had married Una Esther, née Studman, and they had two children. After the dissolution of that marriage, he married Sylvia Marie Evelyn Wells at the Registry Office, Canberra, on 20 March 1976. Bradshaw was noted for his distinguished appearance, dignified manner and careful speech. The use of correct English was something of a preoccupation with him. He was happy to bear the surname of the great seventeenth century champion of the parliamentary cause, John Bradshaw, but added that, unlike his namesake, he had no wish to terminate the monarch or the monarchy! He was appointed an Officer of the Order of the British Empire in 1982. Altogether Mr Bradshaw has served for some 32 years in this chamber. During that time he has seen many changes take place and has made a great contribution not only to the Senate but also to the Australian parliamentary institution itself. On a personal note, I thank him very much for the kindness he has extended to me since I became President of this chamber … He has a very gentle and friendly manner and one which attracts people to him. Keith Bradshaw passed away on 2 February 2017. He was survived by his wife, Sylvia and his children, step children and grandchildren. Bradshaw, Keith Oscar—Defence Service Record, A9301, 422793, NAA; Bradshaw, Keith Oscar, Department of the Senate personal history file, A8804/22, NAA. CPP, 108/1959, p. 173, 304/1963, p. 54, 201/1971, p. 6. Clerk of the Senate—Appointment/retirement, file 82/554, Department of the Senate; CPD, 20 May 1982, p. 2221. This biography was first published in The Biographical Dictionary of the Australian Senate, vol. 3, 1962-1983, University of New South Wales Press Ltd, Sydney, 2010, pp. 567-569.